Looking down the colourful Main Street on Isla Zapara. I had used up a month’s worth of good luck and karma points to make it into Venezuela in one piece. 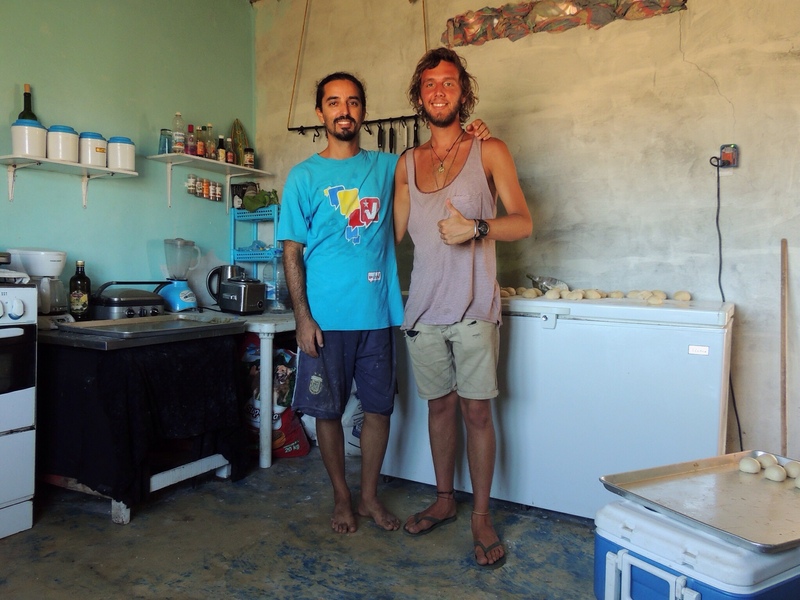 I met my Couchsurfing host, Walter, at his camping/hostal Latinoamerica and he welcomed me with some delicious home-cooked arepas – a corn-based, cheese filled Venezuelan delicacy of which I would be enjoying thousands more. Waking at first light to the sound of dead silence the following morning (there are no cars on the island) I gazed out of my bedroom window across the long, flat, empty landscape stretching a kilometre to the ocean. Bordering the horizon to the east were the shadows of the 30-metre high sand dunes a mere four kilometres away and between them and my window lay a whole lot of nothing. Getting a sense of the island’s tiny size and relative population, I walked out onto the concrete verandah to the smell of sweet, freshly-baked bread. Walter, a serious jack-of-all-trades, bakes and sells bread, makes pizzas, tends his veggie garden, mixes concrete in a 1950’s labour-intensive fashion, hosts movie nights and throws himself wholeheartedly into the local community. His fascinating story originated in Australia, where he was born, and then traces a path to his parents’ country of Argentina, where he fell in love with the continent. Politically minded, he savours every moment of Venezuela’s turbulent revolution and doesn’t hesitate to share his depth of knowledge (or opinions!) when asked. 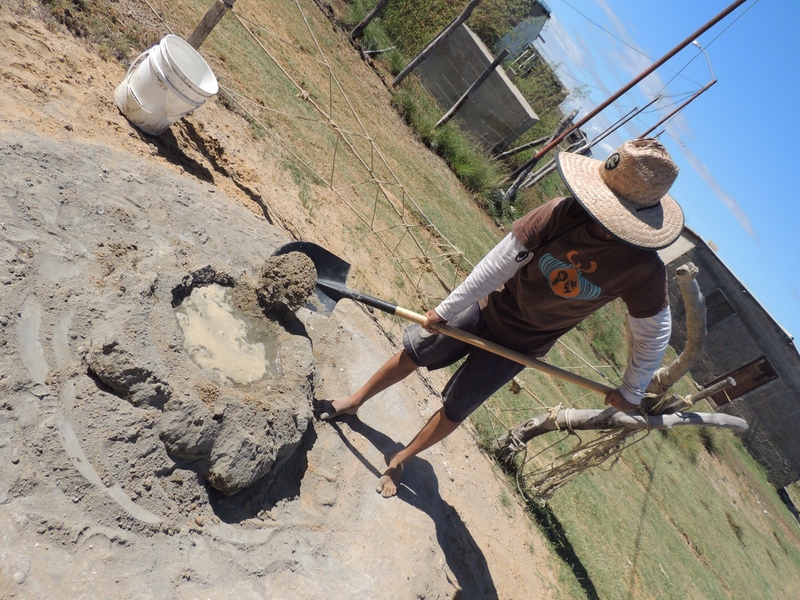 Walter, mixing concrete the hard way. He poked his head out of the kitchen to enquire if I wanted any bread, speaking in perfect Aussie English. Later on when he addressed the locals his accent carried every trace of perfect Argentinian Spanish. His wife and step-son were in nearby Maracaibo for a few days, leaving the pair of us to hang out, do odd jobs, sell bread and drink beer. President Maduro is there to welcome you. And so is his moustache. And that is pretty much exactly what we did. I was taken on a tour of the island and Walter proudly exhibited the achievements of the Socialist government: local wifi internet, water and electricity stations, solar power. Even offshore, multitudes of graffiti and artwork adorn sides of civilian and government buildings paying tribute to Chavez, Maduro (current president) and libertador, Simon Bolivar, after whom the revolution is named. The community is heavily dependent on fishing. 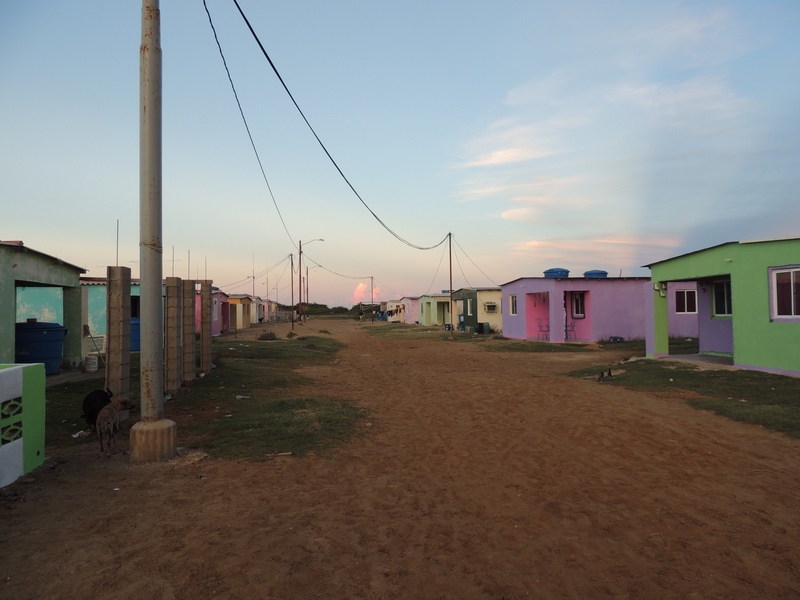 People live in basic, often government-built cinder block homes and paint them each year in beautiful, typically South American colours. There are a couple of shops on the island stocking the available staples – including beer – but a few boats a day traverse across to the mainland for people doing a ‘big shop’. Life certainly isn’t made easy for people, including Walter, who suffer the effects of continually inflating prices and occasional difficulties in finding basic food items. The combination of these things lead me to lead a very frugal life while staying on the island. A midnight bathroom visit required a torch and a careful tiptoe to the saltwater well so as not to wake the donkeys. The rice, having been first nibbled by tiny little worms and insects (who had also convieniently died after their feast), would have been unappealing elsewhere but here it just counted as extra protein. A visit to the local school on my last day on the island left me yearning for my classroom back home and considering never complaining about a lack of resources again. The accessibility to resources for teachers seemed just short of BYO whiteboard marker. As always, a huge thank you to my host, Walter, for being my introduction to Venezuela, a top-notch bloke and a political encyclopedia. Enjoy the few remaining photos from Zapara below. 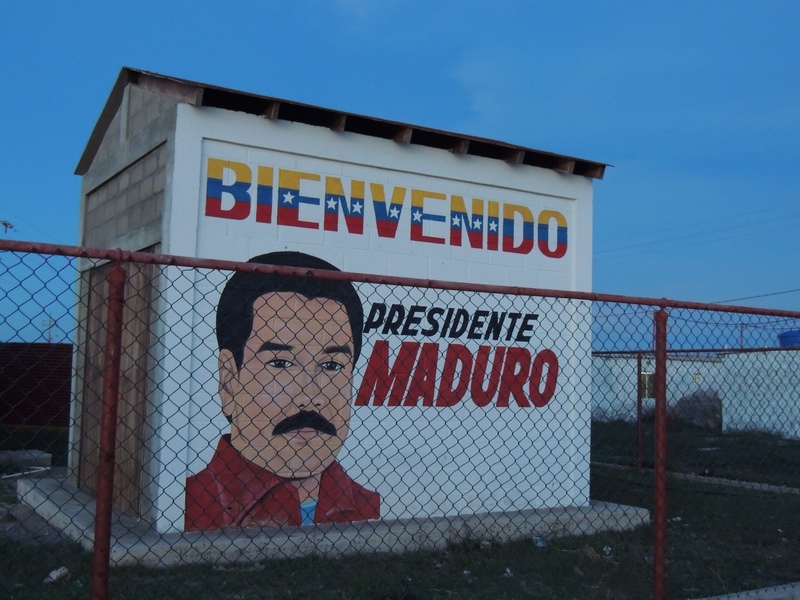 ← Passport Swapping, Border Crossing: Bienvenidos a Venezuela!